Our Cape Cod Chowder represents some of the best local ingredients you can find on Cape Cod. Cape Cod has a bounty of great locally caught seafood as well as vegetables locally grown. Saute in a non-stick fry pan. For instance, we can acquire fresh onions, carrots, tomatoes, peppers, and potatoes at various produce stands from Borne to Provence town in season, and all along the harbors pick up fresh fish. Chris and I love certain types of fish and are allergic to most shellfish so we are at a loss being able to enjoy much what the local fishing economy has to offer. However, we do love Haddock, Cod, Sword and Tuna fish which is why we chose to add our Cape Cod Fish Chower as our Cape Cod Chowder to Easy Everyday Cooking Recipes. Our recent creation incorporates three of the local favorites and fresh fish. The taste sensations incorporated into our Cape Cod chowder are takeaways from some of our favorite ingredients. In our Cape Cod Fillets page, we feature fresh caught Cod. 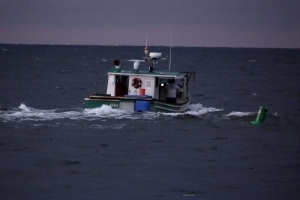 One of the many local Cape Cod fishermen heading out for a days fishing. First of all, one of our favorites is Bacon. Yes, we know, bacon... but who does not love bacon? Last year on the TV show Top Chef, three of the celebrity chef judges would use bacon in every meal if they could. And why not? The next flavor that adds some texture and continues with the bacon theme is Ham. We love Black Forest ham because it is usually not too salt ridden without much fat. Run it through a food processor and you have added flavor and texture without overpowering any of the onion, potato, and green bell pepper. If you like garlic, yeah, it's in there. Salt and Pepper to taste and you have a recipe for fresh fish that anyone who goes “Ewe” at the sight of fish in a milk base will be surprised. Oh, lest we forget, the secret to having this chowder creamy without any added cream or cornstarch is our secret ingredient of roasted garlic mashed potatoes. Right from your favorite grocer. We call our Cape Cod chowder John's Cape Cod Fish Chowder. It takes a little time to prepare, but as fall approaches, who doesn't love a cup of hot home-made chowder. 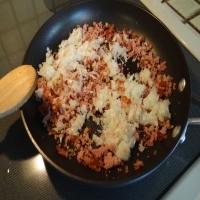 Cook bacon until crispy and leave in frying pan once broken into bits. Mince 2 slices of the ham and add to the mixture and saute with 2 table spoons butter. Do not let the mixture burn. Remove mixture from pan and let stand. Peel and dice the fresh potatoes into small pieces. Place the potato in a crock pot or roasting cooker, add the bacon mixture, half cup of water and partially cook to where you can stick a fork in them without breaking the potato. Remove from heat then add the three 3 cups of milk slowly making sure it does not boil. Once folded into the bacon, ham, onion mixture add the entire roasted garlic instant potato mixture mixing well bringing heat to 200 degrees as so not to boil. While the potato is cooking, place the fresh haddock in a 10 inch covered frying pan. Add a half cup water, cover and cook the fish until it flakes. Once done, remove and strain the fish while adding it to the bacon mixture. Simmer for about 2 hours or until the potato is soft. Remove from heat and let stand for 15 minutes before serving. Serve with a garnish of parsley. Add a half cup of celery for a bit of crunch. Serve with your favorite entree or as an entire meal with a thick slice of warm Italian bread. Try our Cape Cod Fillets - A Heart Healthy Delicious Dinner. 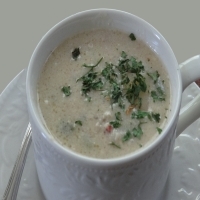 Return to Easy-Everyday-Cooking-Recipes from Cape Cod Chowder. Have A Helpful Household Tip that lets you get more done in a day? Share it! One of life's simple pleasures can be found in passing useful information to others.